After I started testing with ESXi 5.5 (read first post here), I couldn’t get my test Mac Pro to boot from the USB key as the ESXi OS wasn’t being seen in System Preferences -> Startup Disk. 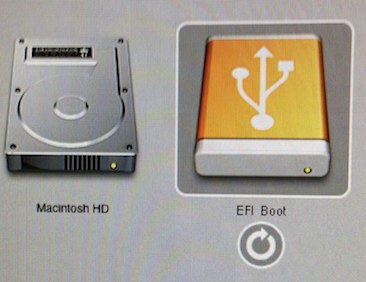 The easiest way to do this is to boot into the Mac boot loader, but how do you have this setting stick after a reboot?! Well, look no further! Press the left / right keys or use the mouse to select the OS you would like to boot from. If you press the arrow the system will boot, but only for one boot or restart. To make this boot drive the default boot drive after reboot, press and hold the control key and you will see the straight arrow turn into a circular one, as in the image below. Keep pressing control and then hit the arrow, the system will boot AND will boot into the same OS from now on, or until changed either in the boot loader again or from System Preferences -> Startup Disk. A little tip when rebooting the ESXi server – remember to shut down all guest VMs and enter ESXi’s maintenance mode before rebooting through the controller application/web interface – if we didn’t enter maintenance mode before reboot, we noticed the server would consistently boot to a black or grey screen. This shouldn’t happen, but then entering maintenance mode before reboot is ESXi best practice as it reduces guest VM corruption, so do it anyway! Want to know how to set MacOS to persistently boot into ESXi? This article will take you through how to boot to the Mac boot loader and set persistent ESXi boot! Yeah absolutely – if you have installed ESXi onto a USB key then just remove the USB key and the Mac will boot into the next OS which will probably be your original Mac OS. What if i want to change the boot back to Mac? The alt or C key doesn’t work for me anymore and ESXI boots by default. Is there a way to remove/unistall Esxi and go back to mac?